The Schleißheim aircraft hangar was built from 1912 to 1919 for the Bavarian air force troops. The buildings are among the oldest airbase constructions still in use in Germany. 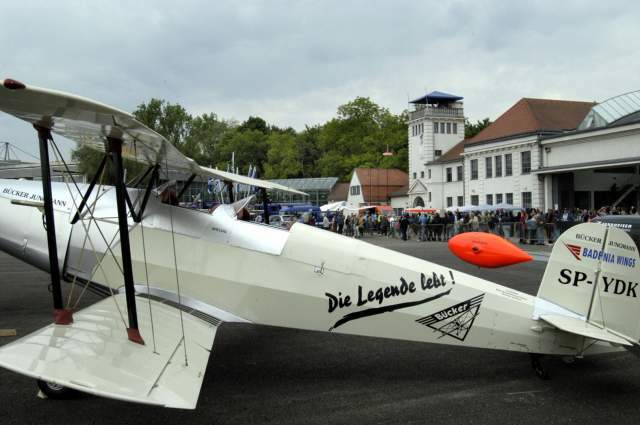 The hangar is located on the premises of a historical, still active airfield 13 km north of Munich’s city centre in the direct vicinity of the Schleißheim palaces. Throughout their history, maintenance hangar and airfield were used for military purposes predominantly. During the 1920s, the location was an important base for regional air carriers and the Deutsche Verkehrsfliegerschule (German school for commercial aviation). After the last air force troops finally left the premises in 1981, a plan was devised to turn the old aircraft hangar into a museum. Today, Flugwerft Schleißheim is part of Deutsches Museum’s center for the history of aeronautics and space exploration. The exhibition at the airfield complements the aeronautics and space section located on Munich’s museum island. Apart from the historic maintenance hangar, the Schleißheim branch of the museum also comprises a large new exhibition hall as well as a restoration workshop with glass walls and a gallery where visitors can view the ongoing restoration work.